When one drop of shadow isn't enough to pop your 2.0 design, one has to innovate with Drop Shadows of Death! To really take your design over the top, just add some drop shadows that drop even more shadows. Normally used to create visual depth or distance between objects, they are one of the most abused effects around, especially with text shadowing! They are supposed to be a bonus, the flavor-of-the-month, just like rounded-corners last year, and gradients before that. Everyone will use them, until some new 'cool' and 'flashy' trend comes along and takes it's place. 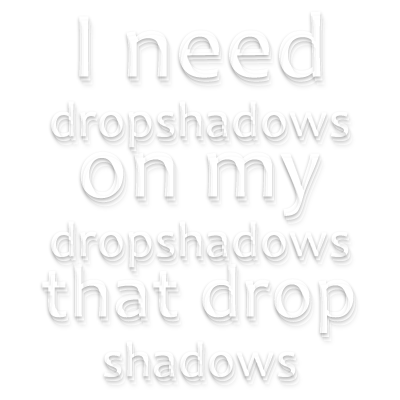 Drop shadows are powerful when used properly, and Drop Shadows of Death might just entice your user to the dark side.